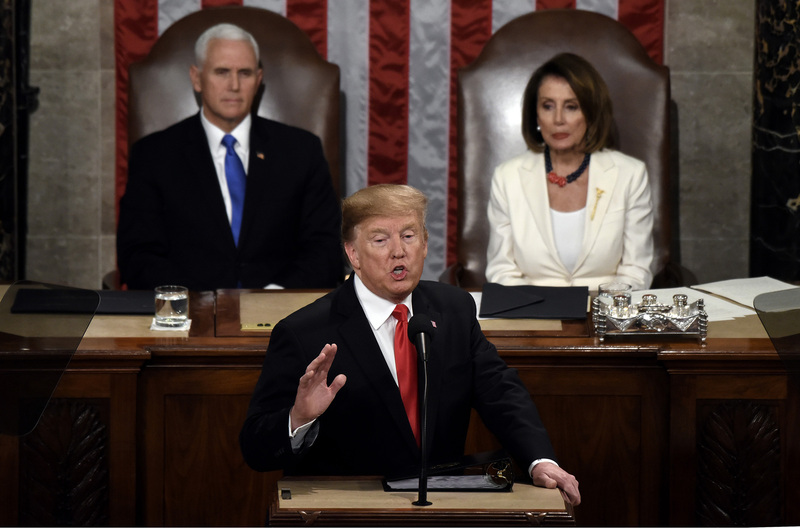 Following a 36-day partial government shutdown, which left politicians bitter on each end, President Donald Trump delivered his second State of the Union address Tuesday night. Par-tradition, Vice President Mike Pence and House Speaker Nancy Pelosi sat behind Trump, the former robbed of customary Speaker introduction practices as Trump wasted no time delving into the address. This address marks Trump’s first to a joint session as one House is controlled by Democrats, and this Congress of course still in talks on deals to secure the border to prevent another shutdown before mid February. Democratic women, Pelosi included, flooded areas of the hall in white, a coordinated fashion statement rich in history. The House Democratic Women’s Working Group invited these politicians to wear white as a message of solidarity and nod to the early suffrage movement of the 20th century. Of course, while not necessarily a Democratic or Republican agenda, Trump laid out his agenda in agreeable terms, reminding Congress these ideals were what “many of us” had campaigned for. “To defend American jobs and demand fair trade for American workers; to rebuild and revitalize our nation’s infrastructure; to reduce the price of healthcare and prescription drugs; to create an immigration system that is safe, lawful, modern and secure; and to pursue a foreign policy that puts America’s interests first,” Trump said, echoing nationalist ideals formerly the root of criticism. Quick to bolster spirits potentially skeptical of this agenda, Trump focused on important historical landmarks the nation should rally around this coming year in search of unity as a country. “In June, we mark 75 years since the start of what General Dwight D. Eisenhower called the Great Crusade — the Allied liberation of Europe in World War II. On D-Day, June 6, 1944, 15,000 young American men jumped from the sky, and 60,000 more stormed in from the sea, to save our civilization from tyranny. Here with us tonight are three of those heroes: Private First Class Joseph Reilly, Staff Sergeant Irving Locker, and Sergeant Herman Zeitchik. Gentlemen, we salute you,” Trump said. In the spirit of the crusader such as Reilly, Locker and Zeitchik, or the explorer such as Aldrin, Trump reminded the nation of its duty moving forward. While consoling to hear such unification presented, it was only hours earlier at a private luncheon Trump shared shrewd comments about fellow Democrats. While comforting, the bipartisan facade did not last long. After recognizing the 58 percent of new jobs filled by women and largest number of women in Congress, Trump spoke on further initiatives to empower women. Perhaps one of the more interesting points of national security was Trump’s announcement of withdrawal from the Intermediate-Range Nuclear Forces Treaty with Russia, a decades old treaty in which Russia has, “violated the terms,” according to Trump. Trump touched on the bettering of relations on the Korean peninsula and the upcoming summit between him and Kim Jong Un on February 27-28 in Vietnam. Touching on the Middle East, Trump spoke on defeating ISIS and returning all troops home, a hollow statement following a Syrian ISIS claimed attack which left four service members dead. After laying out his agenda, Trump came back into the compassionate, bipartisan agenda found early on. For a complete transcript and stream of the speech, head here. For a complete list of what Trump got wrong, head to NPR’s Fact Check here.